In February of 1797, ongoing war and the threat of invasion from the French Republic triggered a run on the Bank of England. 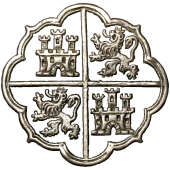 To meet the demand for silver coinage, in March, the Bank was authorized to release foreign currency from its silver reserves, almost entirely Spanish 8 reales. These emergency issues were countermarked at the Royal Mint with a small oval stamp with the bust of King George III -- a stamp that had been in use for hallmarking silver plate. One of my earliest journal posts featured an example of this type. 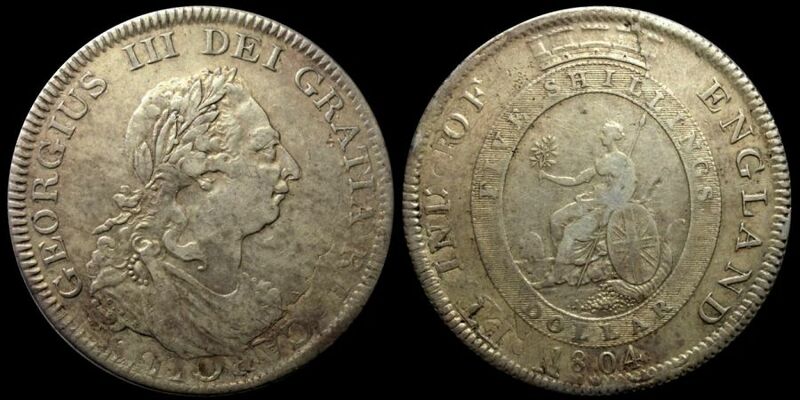 The dollars had a fixed value of 4 shillings and 9 pence but as the price of silver dropped counterfeiters began passing 8 reales with false stamps and eventually forced the recall of these issues in the Fall of 1797. In 1803, renewed war once again affected silver circulation and countermarked 8 reales were issued in January of 1804 using an octagonal stamp of the king's head. False stamps quickly followed and forced the recall of the issues by June of 1804. Clearly a method that would be hard to counterfeit was needed. Fortunately, for the Bank of England, the Soho Foundry of Matthew Boulton and James Watt had been established with Boulton's newly invented steam powered screw press. In May of 1804 the foundry was commissioned to use a previously designed dollar pattern to fully overstrike the 8 reales. These issues were much harder to counterfeit and proved to be so successful that they were issued from 1804 to 1811, although all show the 1804 date, and were not removed from circulation until 1816. The power of the steam driven press typically obliterated the host coin's details, but occasionally you will see one that still shows some underlying details and that's what attracted me to my example. This one, a new purchase from Heritage Auctions, is a raw example so I took the opportunity to examine it in detail. Curiously, a section of the host coin is thinner -- where CAROLUS is visible under George's bust and ET IND shows on the reverse. I can make out a date of 180? but I can't see a mintmark. Of interest is the edge which still shows much of the alternating rectangle and circle design albeit oddly curving from top to bottom. Now the funny part. This coin only weights 25.67 grams and compared to a full weight 8 reales at 27.0674 grams, even with loss to circulation, it seemed too low. That plus the uneven thickness and the wandering edge design made me suspicious. So I measured the thickness (averaged over four spots) and diameter and calculated its volume. After converting the volume from cubic mm to cubic cm you can divide the weight by volume to get the specific gravity. A 90% silver/10% copper coin has a specific gravity of 10.3 but mine is 9.5 which means there could only be about 40% silver content. Assuming that the overstrike is genuine (I have to trust Heritage on that) this appears to be a contemporary counterfeit 8 reales host coin ("contemporary" meaning that it circulated at the same time as genuine issues) . Now, I'm not at all disappointed to discover this -- I think it's a much more interesting coin this way. 8 reales have been heavily counterfeited over time and the problem remains between distinguishing contemporary ones, later ones made for trade with China and modern forgeries. With the overstrike occurring in the 1804-1811 time-frame, this one falls into the contemporary counterfeit category (a collectable category on its own). edits for typos and clarity. Previous entry 1560 Mansfeld thaler, What's so Special? Jgenn, will you have this slabbed by NGC or is it ineligible? I may submit it now that I've done my research on the raw coin. As I understand the NGC policy, they will slab it if the counterstamp is deemed to be authentic. I think the reasoning is that as long as the counterstamp was official the coin became legal five shilling currency regardless of the host coin status. I've seen an obvious counterfeit of a 1772 portrait 8 reales with an oval counterstamp in an NGC slab as a graded GB dollar.